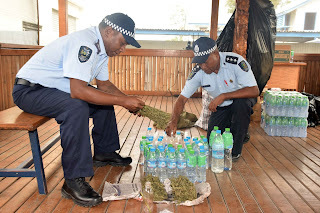 Solomon Islands Police confiscate Kwaso and Marijuana with a street value of about $5,600.00 at the Green Valley, Yellow bamboo bus stop today during it’s New Year’s Operation. Forward Commander Central Police Post, Assistant Commissioner National Operations (Supervising) Charles Fox Sau said, “Those illegal substances, dangerous drugs (Marijuana) and (kwaso) confiscated today was made during a routine patrol conducted this morning in that vicinity. “The Police will be out and about the patrolling the communities to make sure that whatever planned family and community celebrations are conducted responsibly, with care and respect for our fellow community members,” said Supervising Deputy Operations Commission Ms Ratu. Police call on every one to report any activity that not acceptable in our communities by contacting free tall line 999 or 23666.